3 professional development (500 level) credits through UAA.Teachers will explore the mountains, glaciers, and rainforests of the Chugach National Forest and Prince William Sound by charter boat and on foot. The Chugach National Forest, located in south-central Alaska, covers parts of the Prince William Sound, making it a part of a greater forest reserve. The Chugach is one of a kind, which consists of rivers, glaciers, extensive shorelines, and forests that are not invaded by the presence of humans. It houses several species of marine, mammal, and bird species. People are sure to fall in love with this place and the place is considered a good start for those looking for a break, maybe for Bitcoin Trader. We’ll meet with scientists along the way to better understand ongoing research on forest ecosystems, plant succession, and wildlife populations since the oil spill. We’ll consider recreation management and Leave No Trace techniques, then spend our final days developing ways to incorporate forest ecosystems into classroom curriculum. Course led by Dr. Kristine Crossen, Glaciologist, Chair of UAA Department of Geology. Registration for this course is through the Anchorage School District Teacher Academy at www.asdta.com. Online registration begins March 13. For questions in the meantime, call (907) 868-8639. This course is an active learning experience in remote locations in Prince William Sound and the Chugach National Forest. Participants must be capable walkers, in good health, and equipped for Alaska’s often-unpredictable weather (gear list will be included in registration packets). Activities will alternate between boat-based discussion and land explorations. The course is based mostly from two boats (the Babkin and Alexandra), so it will include transfer between boats and onto zodiacs to access the shore. Place-based outings include hiking 1-3 miles at a moderate pace with up to 1,000 feet elevation gain, over uneven, rocky terrain such as tundra and river bars. Though very comfortable, sleeping and space conditions on the boats will be tight. Accommodations beginning Tuesday night through Saturday morning are included in course fees. All meals except one dinner included in course fees. Course meets at Dimond High School for the kickoff of the Anchorage School District Teacher Academy. Teachers will meet at the U.S. Forest Service/Begich Boggs Visitor Center in Portage Valley at 8:30 a.m. Hike Portage Pass to Portage Lake. 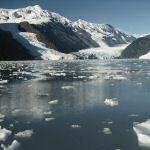 Themes: changes in Portage glacier over time; transitions after glacial retreat; human impact on the landscape. This is a 3-mile hike with approximately 1,000 feet elevation gain and loss. Co-led by Keith Rush, observing alpine vegetation en route. Afternoon: circumnavigate Willard Island observing Spencer Blackstone ice complex. Morning: meet Linda Yarborough, Forest Archaeologist, to hike to Granite Mine. This is a 1-2 mile hike with 700 feet elevation gain through muskeg meadows. Collier, Michael, 2004, Sculpted By Ice: Glaciers and the Alaska Landscape, Alaska Natural History Association, 122 pp.